From its opening scene, Terou Ishii’s Blind Woman’s Curse (1970) lays its cards firmly on the table. Against a backdrop of pouring rain, a clan of deadly Yakuza primed for action scuttle into shot with choreographed precision, their bare backs revealing a patchwork of seemingly random tattoos; as their battle formation comes together it reveals a greater whole – a stunning image of a dragon reveals itself across their combined backs. Their solitary female foe is unnervingly cool and unimpressed standing coiled and ready to strike, portrayed by Meiko Kaji, who would go onto to star in both entries in the iconic, genre-defining Lady Snowblood series. This first scene is ostensibly an exercise in icon creation, and all the more exhilarating given the context and fore-knowledge of Kaji’s latter films. The premise of Blind Woman’s Curse is simple, Akemi Tachibana (Kaji) has vowed to protect her Yakuza clan from a variety of rival factions who challenge their territory. This is classic Yakuza cinematic territory, the film covers themes of honour, stoicism, codes of chivalry and self-sacrifice, familiar now to any film-goer with a passing knowledge of Japanese or Hong Kong cinema. However, Ishii is not satisfied with conforming to generic tropes. Narrative structure serves only as a platform for a dazzling display of visual virtuosity which often veers into the territory of experimental cinema. This playful and brave approach is embodied by a series of surreal characters that Akemi must confront, from a ghostly black cat ghost, to a creepy hunchback with a mysterious and vengeful blind swordswoman as master. The inventive and creative atmosphere is dizzying, and at times extremely confusing, but for those willing to except, or even celebrate, all of its uneven twists and turns, the film is a truly intoxicating experience. 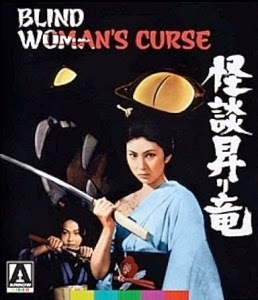 The term cult classic is all too readily banded around; however, under Ishii’s imaginative direction and with a bewitching central performance from Kaji, Blind Woman’s Curse represents a film that for a generation of film fans introduced the unique tone and creativity of Japanese genre cinema. An undoubted cult classic and a must watch, let the geysers of blood flow.